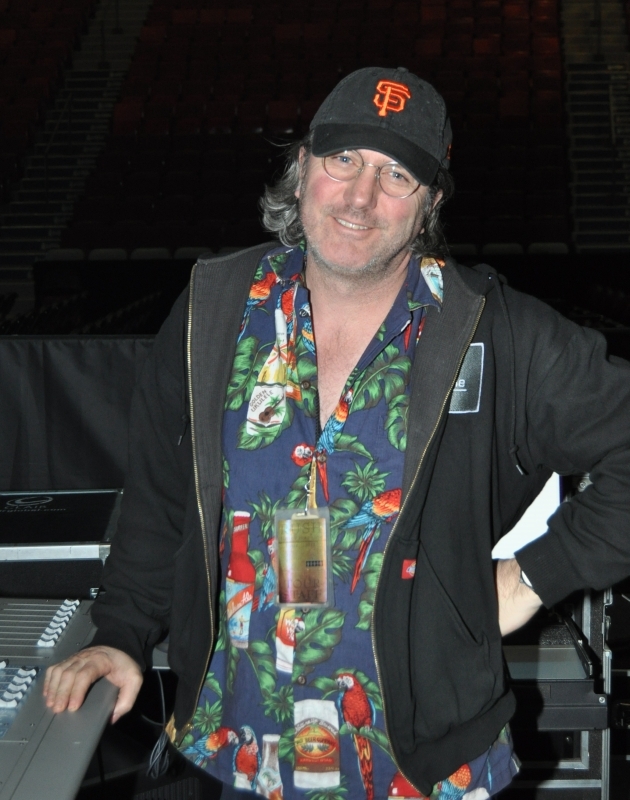 Brad first worked with RUSH for the last half of the Roll The Bones tour. He worked again with RUSH on the Presto tour and has been with RUSH ever since the Vapour Trails tour. Past artists that Brad has worked for include Rage Against the Machine, Jane’s Addiction, Def Leppard, Marilyn Manson, Shania Twain, Queensryche, and Shakira, yes that says Shakira. Brad provides the FOH (Front Of the House) sound for RUSH or put more simply, the sound the you, I, and the thousands of RUSH fans hear every show. Brad has been working for several tours with Brent Carpenter who provides the ear monitor (or sometimes headphone monitor mix) for Alex, Geddy, and Neil. 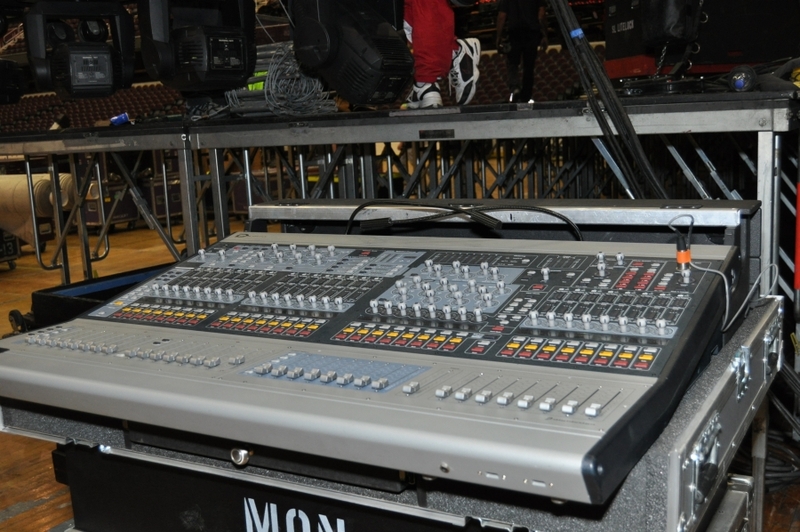 Brad and Brent use Digidesign Venue D-Show Profile mixing consoles. Both loaded with software plugins from McDSP such as Channel G, MC2000 multi-band compressor, and ML4000 multi-band effects/dynamics software. These plugins provide excellent sound quality and tools for quick and ease of use. Brent and his console are located on the side of Stage Left or Geddy’s side of the stage. Brad and his console are located at the back of the venue, in the centre just in front of Howard and the lighting/production control area. 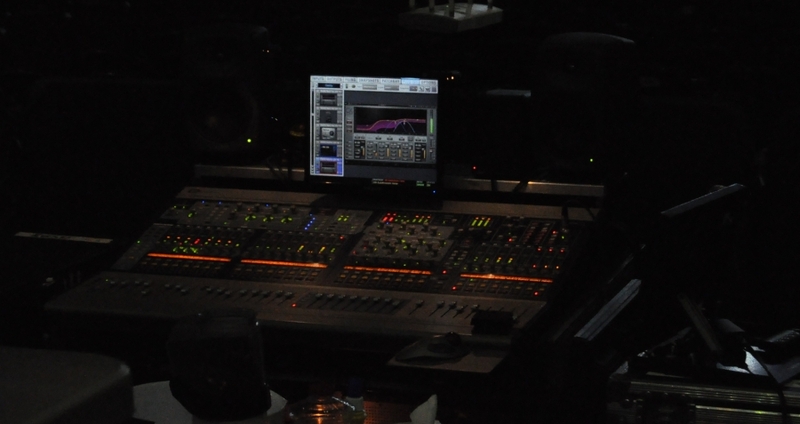 All of the inputs are fed into Digidesign Stage Racks and converted to digital. A digital snake system replaces the bulky analog snakes and provides bi-directional communications for audio and control data. 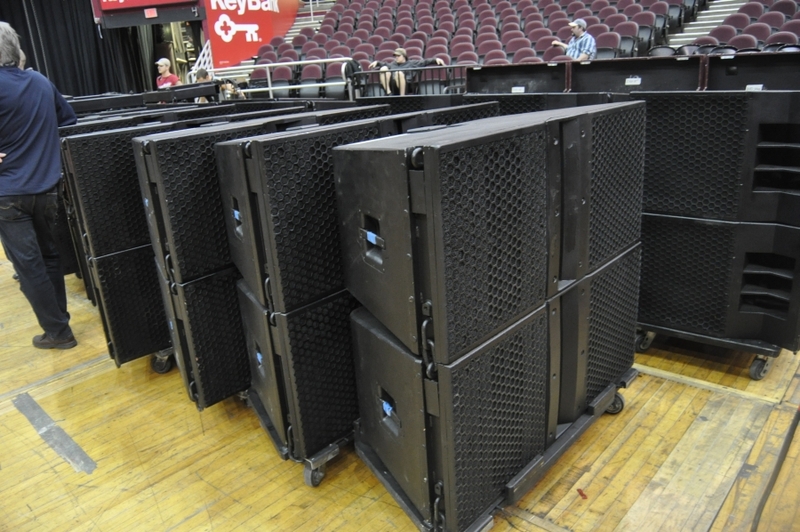 Digital transportation prevents ground loops between the stage and mix positions. 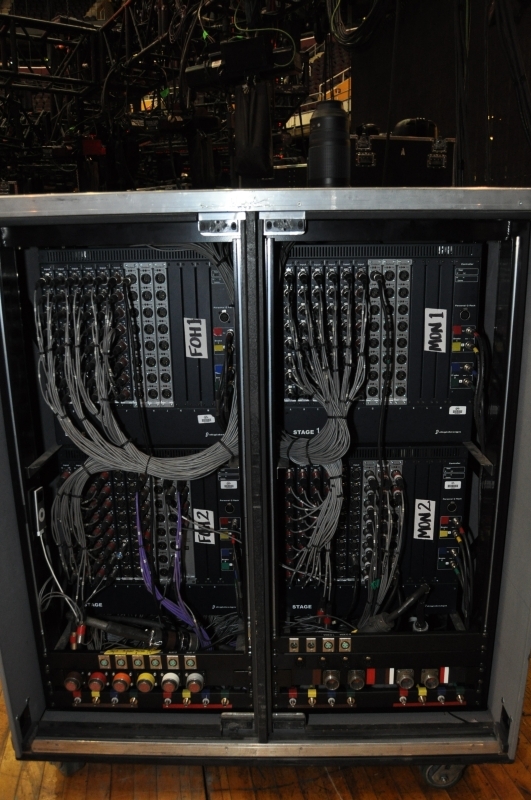 The Stage Racks are located on the side of Stage Left near Brad’s monitor console. RUSH usually uses two stage racks, one feeding the FOH console and the other the monitor console. 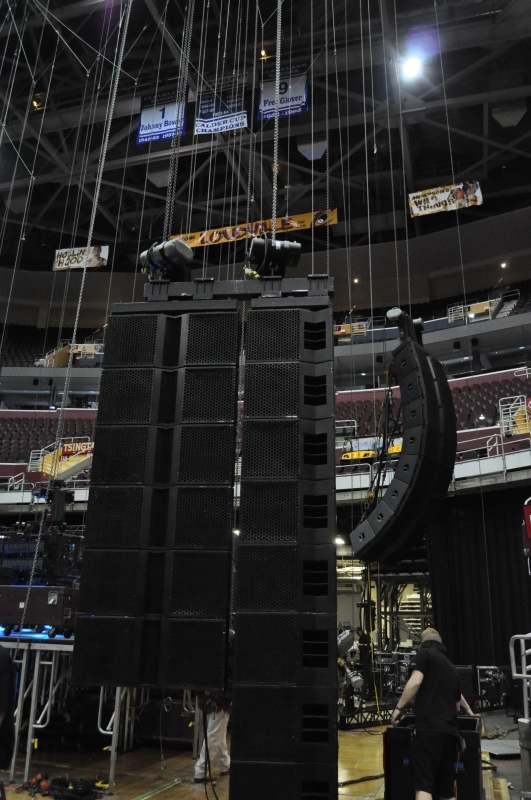 For Cleveland they added two more racks, splitting the signals out to a truck located outside the venue which will use the feed for the sound on the upcoming Time Machine DVD. The audio crew, like the lighting crew, need to wait until their rigging has been setup. When you get into the bigger venues take a look up and see how high the rafters are. Then imagine crawling around on these rafters carrying heavy cables. Not my cup of tea but none the less a very important part of the stage setup. 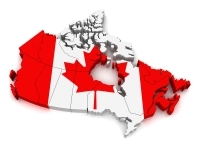 The riggings have to be very secure and in the correct position… and there are a lot of them! Every bit of the lighting trusses needs to be rigged, the spider, the video screen, and of course the speakers for the PA. In one picture I stood directly under the main speakers and lighting for Stage Right, it’s a little intimidating. I never made it early enough but I do believe the riggers start somewhere around 8:00 to 8:30 in the morning. Most of the gear starts to get unloaded from the trucks around this time as well. They are the first in and last out each show (actually I think the stage manager George also follows these hours, even worse he needs to oversee the complete setup and take down, now that is a long hard day, I basically stayed out of his way)! 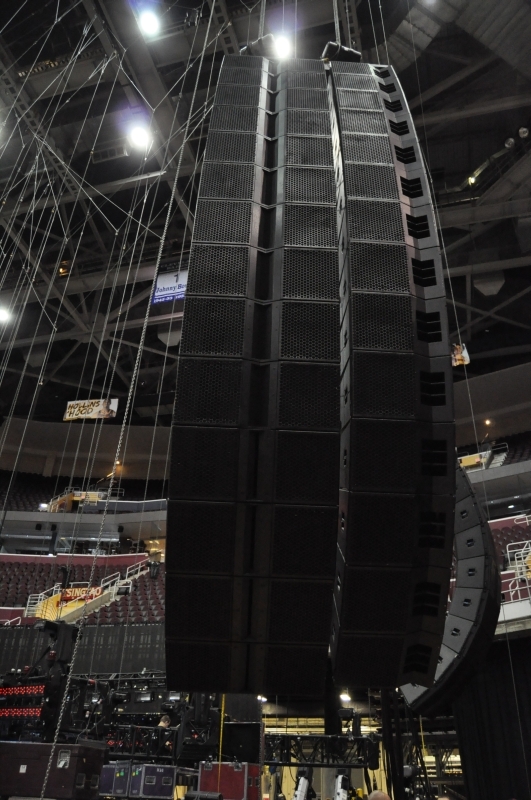 The top speakers are hooked up to large clamps which in turn are attached to electrical motors that will be used to lift the speakers and cables up to their final position. There are bags located on the side of the motors, as they rise, the excess chain falls into the bag keeping it nice and neat and out of the way. The motor raises the speakers a little, the next speakers are moved and clamped into place, speaker cables are attached, move these up a little, next speakers, and so on until they are all in place. 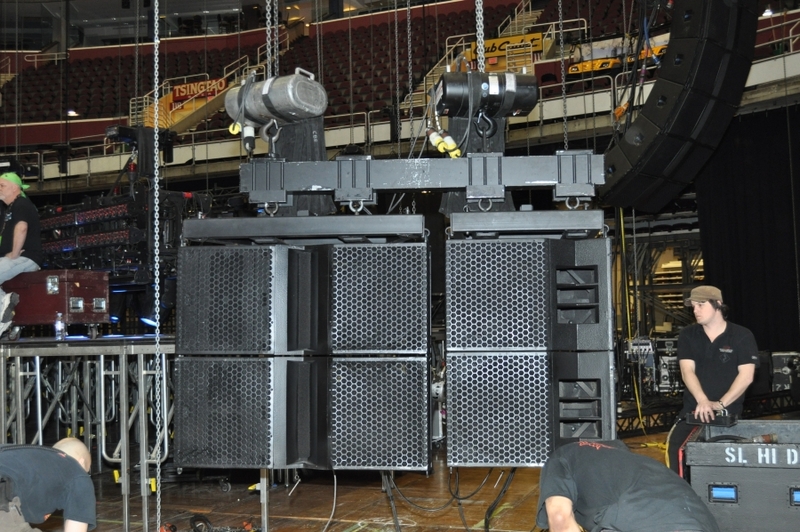 When all of the main and side speakers are done be assembled, they are lifted high into place for the show. 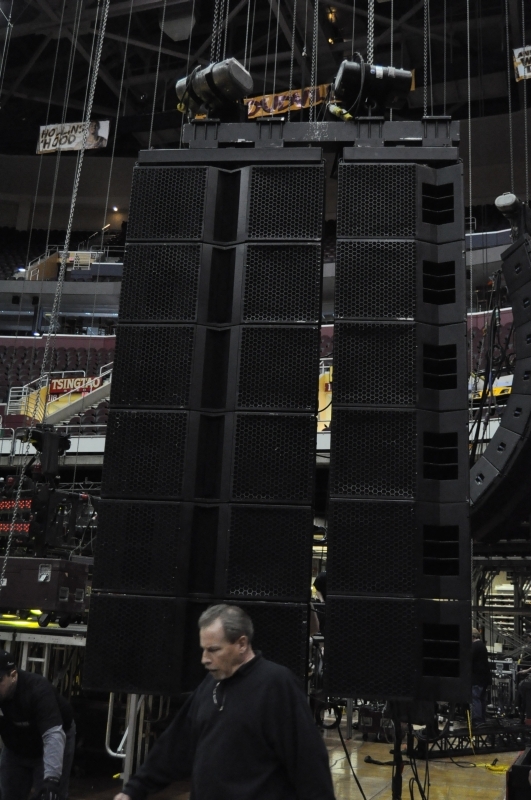 How much power is used for the speakers? 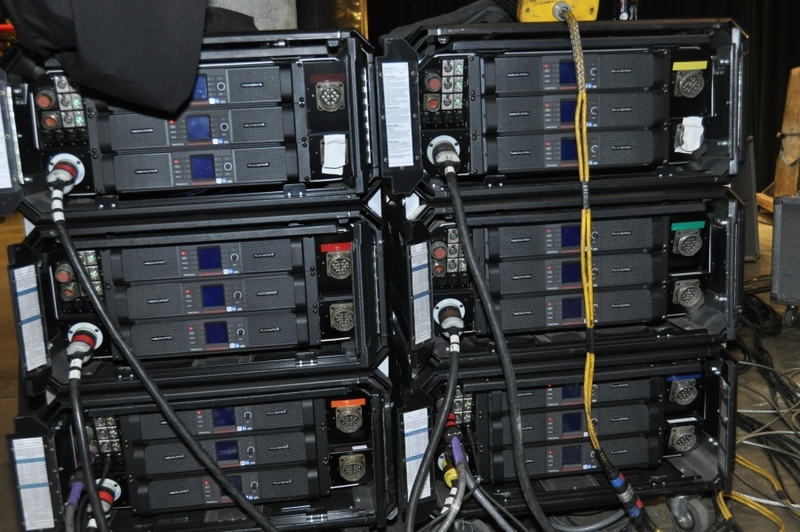 There are 18 Lab Gruppen PM20000Q state-of-the-art amplifiers each putting out 4 clean channels at 5,000 watts per channel and located on the side of Stage Right. You can do the math, 18 amps, times 20,000 watts for a total of 360,000 watts rated at 2-3 Ohms. Brad and Brent informed me that there are 3 more of these amps located somewhere else, in which case it brings the total to 420,000 watts! 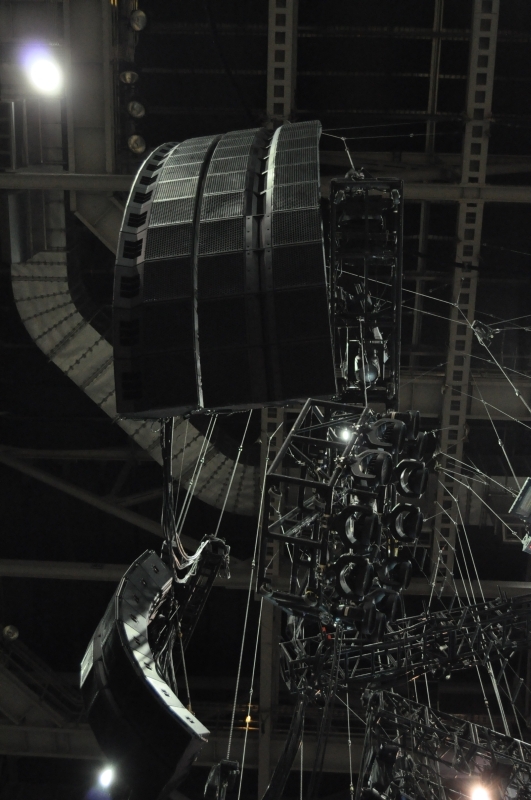 On an average night they use around 65,000 watts. 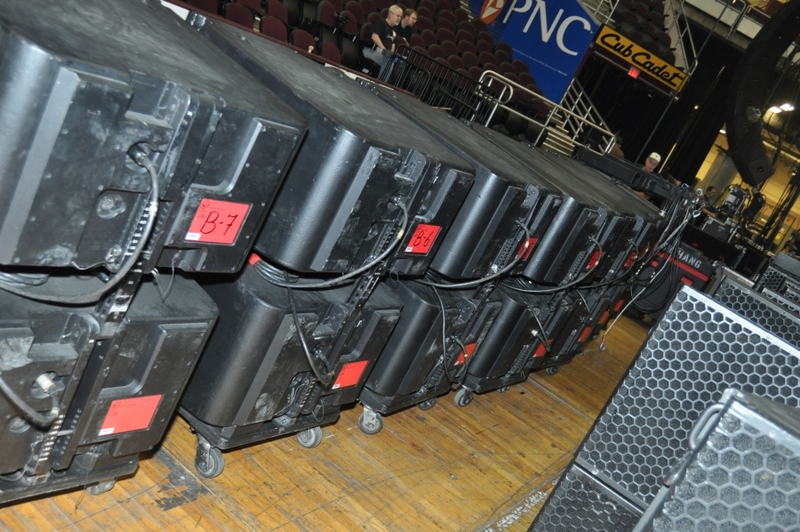 The amps and speakers have become so much more efficient that they no longer need to force out hundreds of thousands of watts through the PA.
Once the PA has been totally setup I noticed that they walked around the different levels in the venue taking sound measurements. I did not have a chance to ask them what this was for but I would have to assume it was to try and provide a equal sound level and quality for everyone in the venue. The song these used for this test, Subdivisions, over and over! I asked Brad what would happen if a speaker blew or a cable quit; the answer, take it back down, fix the speaker or cable and put it back up! One more interesting tidbit: There are 5 tour buses, we know who one belongs to, there are three buses that hold 8 crew members and one more that holds 7 crew members. As nice as the buses may be, you all better get along!